Up until today, I've been pressing tofu with a stack of paper towel, frying pan (for weight), and time. Since I've finally found some recipes that I enjoy making and eating that involve tofu, I figured it was time to invest in some sort of press to get the moisture out instead of wasting a bunch of paper towel every time. So I bought the most basic press I could find - the EZ Tofu Press. And it's pretty easy to use. Just tighten and away you go. 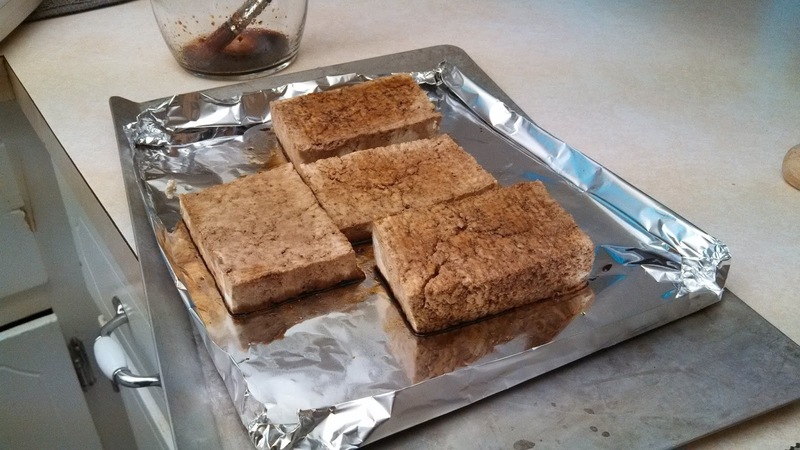 I used the press on both a block of extra firm tofu and a package of cubed tofu. 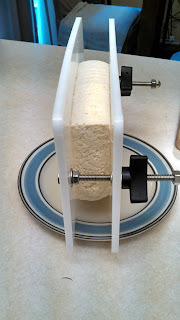 It's possible to use the press with the cubed tofu, but it is a lot trickier. 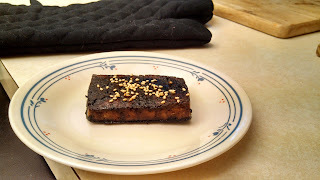 After 30 minutes and I felt everything was "dry" enough I decided to try a new recipe - Baked Tofu with Soy and Sesame. Usually I press tofu for at least an hour and a half, so this was a lot faster. I sliced and marinated the tofu. Then baked for about an hour. I overcooked the thinner slice I had, but overall the recipe came out pretty good. I'm pretty happy with the recipe and the new tofu press. I am now prepared for the next visit from Comfort and Adam!